Next year, I will return in Santa Barbara with my family to show them the most beautiful place that I have never seen; The Franceschi Park. This park was once the home of famed botanist F. Franceschi. I discovered this place with my SPIN class ”I LOVE SB”. The purpose of this class was to discover the city, and it worked. The park is located above the city. By car, it is only ten minutes from Downtown or one hour by walking. The location is pretty easy to find. There are direction signs along the way so you can not get lost. It has a panoramic view of the city and it provides a tranquil horticultural resource. A lot of people go there to relax themselves, do sports, walking their dog or just enjoy the view. In addition to the view of the city, you also have an ocean view. On sunny days, you can easily distinguish the different islands, like : Santa Cruz Island, Santa Rosa Island, San Miguel Island and Anacapa Island. Those four islands are quite far from the waterfront, more than 3 hours by boat. Further into the park, you can observe a house. It was the house of M. Franco Franceschi. This house was used for botanical study and plant cultivation. This one became a botanical nursery for their experiments in plant propagation. Between 1894 and 1913, Franceschi imported over 900 species. He planted an enormous variety of native and non-native trees, like oak, camphor, cinnamon, avocado, banana, candlenut, and many species of citrus and palms. Many kinds of seeds were also grown on this area. Finally, through Franceschi’s efforts, almost 200 new plant species were introduced to California. Unfortunately, F. Franceschi died in 1924 and M. Freeman inherited the house as well as the property. He was a huge fan of Franceschi’s work. Through his efforts, the property was enlarged and the house remodeled in a Mediterranean style. Freeman donated it to the city of Santa Barbara. That is why now everybody can go there. But the problem is that the city of Santa Barbara did not do the necessary renovations and maintenance and the house has fallen apart. For that reason the city of Santa Barbara decided two weeks ago to demolish the house and to rebuild something else. After being in Santa Barbara for a few days, there is one thing everyone tells me about living here: it’s so expensive. Is Santa Barbara becoming the new Beverly Hills? Is the middle class being excluded from this beautiful place? Coming from Belgium, I’m surprised to see the price of a single-family home. Prices are more than double than what I’m used to. What would be influencing these prices? Is it the gorgeous coastline and mountains, or is it the amount of multi-millionaires and celebrities that escape busy LA and San Francisco? Many celebrities put Santa Barbara on the map by buying a home to live in on the weekends or during holidays. It’s their second home to get away from work. Same situation with the owners of big companies, they probably run their businesses out of LA or San Francisco and come to Santa Barbara to live a stress-free life. This is influencing the prices of the different neighborhoods in the city. Some places are becoming exclusive and hard to get in for many families. In the future, I see myself as a real estate agent and real estate investor. Everywhere I go, I look for what’s on the market and what prices are common in the area. (The Zillow app is a real good friend of mine). 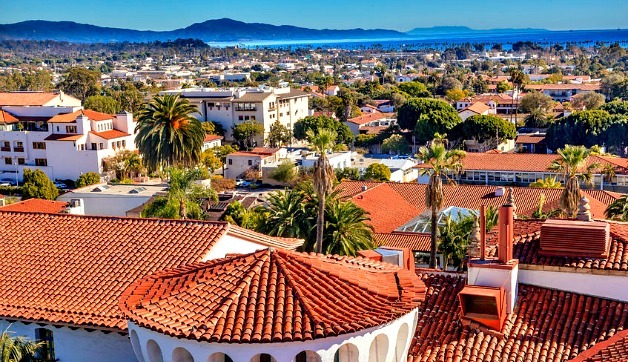 If you look at the statistics, you can conclude that the median sale price is around $1 million dollars in almost the whole county of Santa Barbara. If a middle class family is looking for a place to live, they are most likely to find an apartment downtown or a single-family house in the Goleta area that they can afford. If they are looking for a house closer to downtown (West-Montecito, Mission Canyon or Hope Ranch), the listings get more exclusive and you are most likely to pay $2-3 million dollars for a single-family house all the way up to $30 million dollars. Is it realistic for a young couple who just got out of college to find a home that suits their ideas for the future? Maybe they want kids and a dog, so they will need a garden and a good location close to school. In their situation, they need a single-family home with 3 bedrooms, 2 bathrooms and a decent sized garden for their dog and kids to run around in. If both of them have a job, they are likely to have at least two cars. So they also need a garage or enough parking space on the driveway or down the street. I went to Zillow.com and entered my needs all the way from West-Goleta to East-Carpinteria. The website gave me around 130 results. Only 19 of these homes were priced under 1 million dollars (which is around 14%). Only five of these homes are close to the downtown-area. The remaining 14 homes are located in Goleta or Carpenteria. So for first-time home buyers, it’s probably more interesting to start looking for a place in Goleta or Carpinteria, or they can buy a condo around the downtown area for the same price. If you really want to live downtown or in the more exclusive areas of Santa Barbara, you’ll have to save enough money and decide to move later in your life. This explains the statistics I found about the residents of Santa Barbara on Trulia.com. Only 52% of the residents of Santa Barbara are the owners of their own houses. Also, the median age of a home-owner in Santa Barbara is 42. So for this topic, I didn’t just want to write about these nice homes by looking at the pictures and the descriptions. I wanted to see these homes and see for myself why these homes are so expensive. Is it the view, the safety of the neighborhood or the privacy that make these homes so expensive? There are many expensive houses in Santa Barbara county, some which are more expensive than the others. But for “The Luxury Side of Santa Barbara”, I want to focus more on three luxury areas: Hope Ranch, Montecito and Santa Ynez. Hope Ranch and Montecito are very similar. Both areas offer beautiful ocean and mountain views and there are even some homes which have access to a private beach. Santa Ynez is different. It is located around 30 minutes North-East from Santa Barbara. Most of the homes are considered ranches which have vineyards, paddocks and barns. Hope Ranch is located west of downtown, the area has beautiful palm tree lined streets and a few gorgeous golf courses. Home prices in this area go all the way up to $25 million dollars. On Sunday October 7th, I went to three open houses in this area. The first house was a beautiful beach house with amazing views of the ocean and the Channel Islands. It was the smallest house I visited, but still the most expensive one. This is not surprising since the two most imported things in real estate are location and views. The next house I visited was just a few-minutes drive up the mountain. This house was the least expensive one, but still the biggest house with the most living space, indoors and outdoors. Since it was higher up the mountain and all the electricity cables on the street were underground, the views got even five times better. The last house I visited was all the way up north in Hope Ranch. The house was located on a dead-end street and was surrounded by a beautiful golf course. Since this house has no views, it provides you a lot of privacy and it has a pool and hot-tub. This house felt very different than the other two homes, but from the inside it was definitely the most updated. Montecito is located east of Santa Barbara. This area has the most beautiful and exclusive real estate in Santa Barbara. Montecito is a community of its own. There are some beautiful stores, hotels and beaches that are very famous and exclusive. Some hotels in Montecito are considered the best in the United States. Montecito is also known for having celebrity residents. Ellen DeGeneres, Katy Perry and Oprah Winfrey all own a beautiful estate in Montecito. On Sunday October 14th, I went to three open houses in this area. This house, close to Coast Village Road, is a modern house with floor-to-ceiling windows and gorgeous mountain views. The modern homes are very rare here in Santa Barbara. That’s why the house is rather expensive for it’s low square footage. The next house was just down the street from the first one. This one faced towards the ocean so it has beautiful ocean views. The house had multiple levels with a gorgeous game room, sauna and even an outdoor kitchen. Every room has a beautiful ocean view. The last house I saw in Montecito was definitely the best one I saw in all of Santa Barbara. It was all the way up in the mountains of Montecito, far away from the busy streets downtown. It was extremely quiet. The only thing you could hear were the birds and the fountain that was running into the pool. The views here were almost unbelievable. You could see all the way from Carpinteria to downtown SB and the pier. 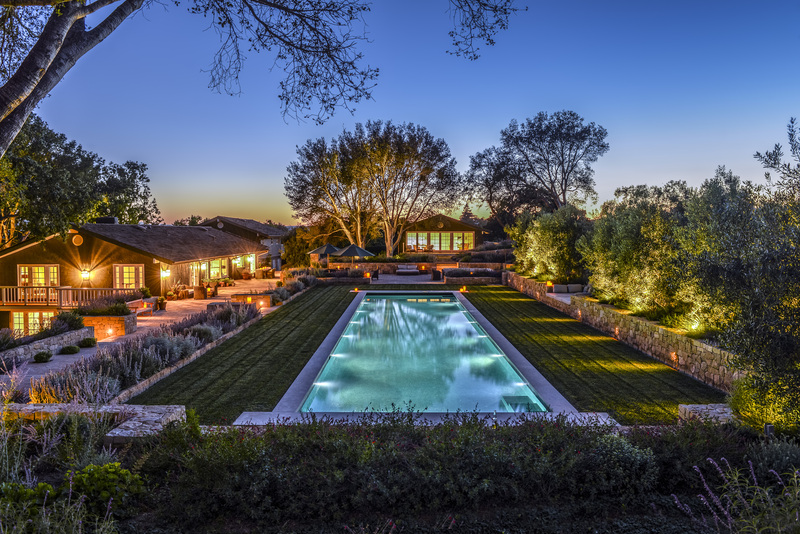 Santa Ynez is about a 30-minute drive from Santa Barbara, but also has some amazing luxury real estate. The real estate is very different from Hope Ranch or Montecito. Most people in Santa Ynez want a vineyard or horses, so most of the real estate has a lot of land and people are looking for ranches. Prices can also get really high. You can buy a rather small ranch for about $3-4 million, but, if you are looking for a ranch with more than 100 acres of land, you can easily pay around $13-14 million dollars. Santa Ynez is also a popular spot for celebrities. The famous “Neverland Ranch”, which used to be Micheal Jackson’s house, is now for sale for over $60 million dollars. Also, the famous singer Pink bought a ranch in Santa Ynez five years ago and is now starting her own wine brand. So, in conclusion, I can say that Santa Barbara is an expensive place for first-time homebuyers and maybe even homebuyers in general. There are also many hidden places that were turned into exclusive and luxury neighborhoods, and, last but not least, there is a real estate market for celebrities that want to escape LA for more privacy. Some people don’t understand the interest runners have in running. Maybe it’s because you don’t know all the upsides of running? So I understand that it’s difficult to begin running because you don’t see the positive effects immediately and that may take a long time to see real improvement of your skills. But anyways work pays. I will show you in what ways it’s good for you. First, running is good for your health like every sport, everybody knows that. You have to know that our immune system gets stronger when you run slowly. Moreover, running activates the blood circulation and that’s really good for our heart. That prevents many diseases and can also have a healing effect. Running also has a good effect on our bones and joints. Indeed, when we run our body reinforces our bones and joints to protect them against the impacts of each stride. Then, running gives us a strong mental attitude. Running can be difficult and unpleasant even for people who have run for a long time. When you are in this bad stage, you must have a strong motivation to push on. Running is like a long project on ourselves to exceed our limits and be proud of ourselves. So jogging also has an effect in our daily lives, that improves our self confidence and mental capacities. So it’s good to overcome daily problems. You can also run to overcome stress. Yes it’s true. Imagine that you have a complicated and stressed day period, in the evening you put on your running shoes and just think about nothing. When you are running, you forget all the pressure you have on your shoulders and you go back home with a smile on your face. Some Swedish studies even say that running can eliminate some toxic substances cause by stress and anxiety. Finally, a big upside of running is the effect on our longevity. In fact, the Harvard school made a study that says that a heart which beats less quickly at rest is an important criterion for lengthening life. Moreover, in average, chronic diseases appear later in runners’ lives than in non runners’. So as a conclusion, running can change your daily life physically and mentally. You have to try and push on even if it’s difficult because nothing is won without effort. For me, running is also a way to escape from my routine, get some air, and discover amazing landscapes, especially here, in Santa Barbara. So get rid of your false excuses and go running. I can also give you some spots where you can go for a run. For me the better place is Santa Barbara Waterfront. When I run around 6 or 7 p.m the sunset on the ocean and the mountain is amazing. Then, you can find below a link for a website where you can find every run’s spots of the city. I live in a little city in West Germany. The name of the city is Stadtlohn, not far away from the Netherlands. My city has only 20,000 inhabitants, so Santa Barbara is much bigger because Santa Barbara has around 92,000 inhabitants. I will have only been here for 6 weeks in SB, nevertheless, it is a big change for me. Not only the number of people who live there is a big difference, but also the style of the houses. The houses of Santa Barbara have a very special style. They have white walls and red tiled roofs. The houses in my hometown are all different. I cannot say how a typical house in Germany looks, but what I can say is that the houses are often much bigger than in Santa Barbara. Added to that to go shopping is a very different thing, too. When I want to go shopping for some clothes in Santa Barbara, I only ride with my bike to State Street and there are a lot of different clothing stores. When I want to go shopping in my hometown, I have to drive around one hour with the car because in Stadtlohn there is only one great clothing store. Moreover, in Santa Barbara there is literally always something happening in the city. It does not matter what time is it. There are always many people walking around. Also you can do many different activities. For example you can go to the beach, surfing, stand-up paddeling, hiking, bowling or you can go to a disco in the evening. In my hometown, there is never really much going on, because we do not have many activities we can do. The sea is really far away (around 2 hours by car) and, in addition, we haven’t got a lake to swim in. So when it is really hot we must drive to another city or we must go to the public outdoor pool, but this is not very much fun. In addition, we do not have a disco, a cinema or something like this. For activities like these we have to drive to the next city. But a big advantage of my little city is that everything is reachable by bike. All my friends live only a maximum of 15 minutes away from me. So it is really easy to meet them and I am independent because my parents do not have to drive me and I do not have to wait for a bus. Also I do not have to pay for something. Compared to Santa Barbara, this is a big difference. For most students who live in a hostfamily must ride the bus every morning and sometimes the way is longer than 1 hour. I had a lot of luck in that I have the possibility to ride a bike to school every day here in Santa Barbara. Also my way is not too long. I only need around 15 minutes. But on the first days it was really stressful and complicated to ride the bike because the driving rules are really different to the driving rules in Germany, too. Here in Santa Barbara there are many streets, where all cars drive in the same direction. So you don’t have oncoming traffic. Every second street goes to the left and the other streets go to the right. This is possible because all the streets are parallel. In Germany you always have two-way traffic. So you can drive on every street in every direction, also with the bike. The last difference i want to talk about is that in Stadtlohn everybody knows each other. In Santa Barbara you are one in a thousand. On the one hand, in Stadtlohn, there is a strong family environment and it is fun when you go in the city and you can be sure you will see people you know, but on the other hand, they also talk about everybody. So when there is new gossip, everybody knows it directly, for example when somebody posts an ugly picture on Instagram. Compared to Santa Barbara, there are so many different kinds of people and it doesn’t matter what you say, do or wear. In conclusion, I can say that Santa Barbara and Stadtlohn are completely different. 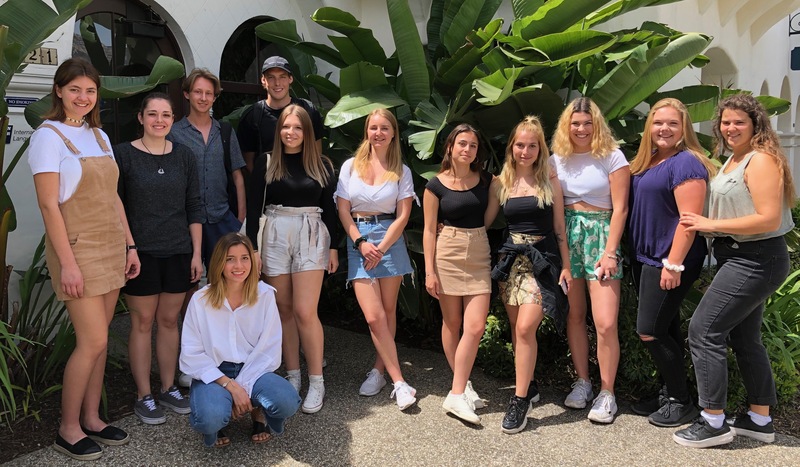 In my point of view Santa Barbara is in every case the better city for a vacation because of all the activities you can do and the good weather, but for living, I prefer Stadtlohn because in Stadtlohn the living standards are higher. When you want a big house in Santa Barbara you need a lot of money. Also you need a lot of money in Stadtlohn, but most of the people can afford this. I think the reason for that is that in Stadtlohn you have better chances to get good jobs. Paseo Nuevo is located in the downtown of Santa Barbara. The complete address is 651 Paseo Nuevo, Santa Barbara, CA 93101. Paseo Nuevo is a familial place where you can go as well with your friends than your family. We observed that the average age was young. How is the architecture there ? It’s a modern place with white walls and red roofs inspired by Spanish Colonial. We feel when we walked there that there is a relaxing ambiance. It’s very chill. My name is Tim and I am from Germany. I just arrived in Santa Barbara and I love the city by now. The beautiful streets and houses with the Spanish style look great. That’s one reason I chose this location for my EF study time. What do I normally do in Germany? I finished my exams in January and want to start my university studies in business education in October. So I have enough time to explore the world. For my study time I want to improve my English speaking and writing skills so I chose an English speaking country, but also one where the sun is shining quite often. I like to do sports very much. I play soccer at a local German soccer club and go the gym at least two times a week. Playing sports is a very good balance for learning or working and you can turn your head off for a time. Furthermore, I love music. On the one hand, I like to listen to different kinds of music as well as making music on my own. I can play the piano and the guitar and I really enjoy creating music with some friends of mine. My favorite food is pizza, but I can’t wait to eat some good Mexican food or beef burgers in Santa Barbara. I already went to one Mexican restaurant and the food tasted great. Maybe you can give me some suggestions about where to go. I will try as much as I can. How old are you? A: 24 years old. What’s yor favorite food? A: Pizza. What do you like to do in your hometown? A: Hangout with friends, ride bikes and go to the gym. What’s your favorite place here in SB? A: Steans Wharf, a pier with many restaurants. Why did you choose SB to study? A: Because I love small cities and California is a good location and the weather is nice.